When did the U.S. give up on the future? Or, to rephrase, when did the Future stop being a galvanizing possibility and become instead a mirage fed to the masses to make people feel better about an increasingly dystopic present? Think of all those articles about technological and medical breakthroughs that sound world-changing but never seem to make the leap from lab to mainstream. America fiddles while the world burns, literally, for those living in California. 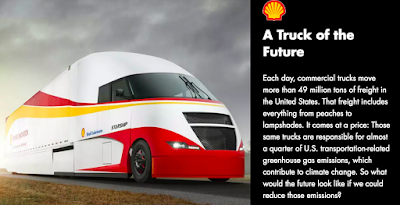 Halfway down a NY Times article about why the whole town of Paradise, California, was lost to unprecedented wildfires, an ad by Shell Oil offers a seductive view of the future, featuring a streamlined truck with solar panels on top. The article was entitled, "Why Does California Have So Many Wildfires? ", and explained that climate change (caused in part by the products Shell Oil sells) is one of the causes. That sleek truck looked familiar, not so much like the future as like something 80 years in the past. Researching a renowned astronomer from the early 20th century, I had been reading about the 1933 Worlds Fair in Chicago, which they called "The Century of Progress." 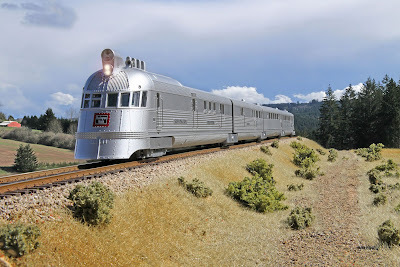 Exhibited at that fair was the Pioneer Zephyr train. This was not some mockup of a possible future, but was a real train that had just made its maiden trip from Denver to Chicago, averaging 77 mph. Within a year, innovations in diesel-electric engines and stainless steel construction had been incorporated into a train that was lighter, faster, more efficient, and actually used to carry real people to real places. Incredibly, according to wikipedia, the train carried 72 passengers plus 50,000 pounds of freight at high speed while powered by one 600 horsepower engine. That's less power than in a souped up SUV unveiled by Jeep last year. Interestingly, that innovation and quick adoption of new technology happened in the middle of the Great Depression, associated more with frugality than gleaming progress. Why? Because people were buying less stuff, railroads sought to lure passengers to fill the void in freight business. Gleaming new high-speed trains were an enticement to travel. But other factors played a role as well. The First World War had served as a model of quick mobilization of people and technology. Even beyond the victorious involvement in the war, collective effort and personal sacrifice for the greater good were more deeply embedded in the national psyche. That was before the 1980s, when the relentless demonizations of government, collective effort, taxes, and personal sacrifice began eroding the national will to take on great projects. When intentional collective effort to solve problems is undermined, we are left helpless to counter the unintentional collective impact of billions of carbon emissions that are undermining nature and ultimately ourselves. 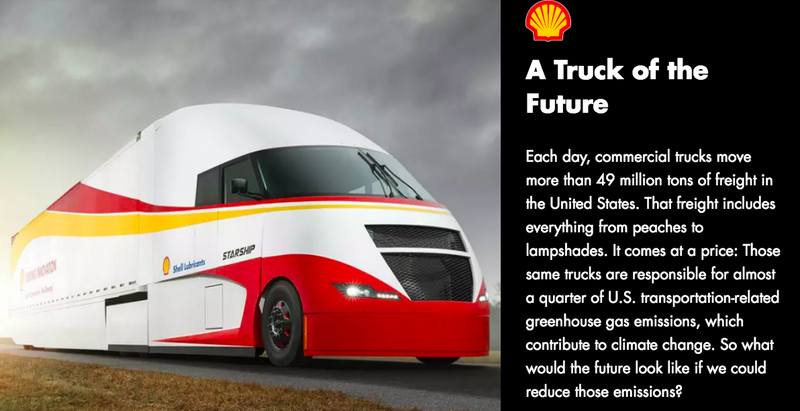 Another picture in the Shell Oil ad showed solar panels on top of the truck that is supposed to carry our economy into the future. The panels look great, and trucks really should have them, but an article on the subject explains that the panels can provide power for everything except making the truck move. The image, then, is intended to make us feel good about a future that logistically remains a mirage. Yesterday, 11.11.18, was the hundredth anniversary of the armistice that ended World War I, and one of the news reports recalled a French town totally destroyed during the war. Fast forward to the present, and witness in our era the obliteration of the town of Paradise, CA, by a wildfire said to be the worst in California history. Climate change, caused by the burning of fossil fuels sold by Shell Oil and others, is playing a big role in making wildfires more destructive. America, increasingly paralyzed and torn by economic and ideological disparities, can find unity only in grief for lives lost and possessions destroyed. Its vulnerability to apocalyptic damage from hurricanes and wildfires has been on full display--threats our massive military is helpless to protect us against. Warnings dating back 30 years have been ignored, while many passively put their trust in God's will, and an economy indifferent to the future. Bereft of government action to address the underlying cause of mayhem, we as individuals are given little choice but to continue feeding a dystopic future, even as a sleek, attractive mirage is suspended in front of us. Only when government makes it in everyone's economic interest to stop poisoning the planet will necessity kick in, and be the mother of true invention.